Incidentally the launch which coincides with Nigerians 49th independent anniversary was performed by President Yar'Adua at the council chambers in the presidential villa Federal Capital Territory Abuja. Performing the launch at the beginning of the council meeting, President Umaru Yar'Adua called on Nigerians to embrace the new currencies as well as strive to keep the naira clean and check the abuse to which the currency has been subjected to over the years, pointing that it is part of the federal government reforms in the money market sector. He assured that the campaign to keep the naira clean has further been sustained by the introduction of the new polymers notes and called on Nigerians to embrace the new notes. Reacting to the new revolution in the Nigerian market before the formal launch of the new notes, the Central Bank Governor Alhaji Sanusi Lamido maintained that the polymer Sub straights is in conformity with international best practices which requires that the currency structure can be reviewed periodically to safe guard integrity as well as ensure efficiency and cost effectiveness. He said the cost of printing the notes has been reduced while the polymer notes have been found to last longer in circulation. According to modernghana reliable checks, it would be recalled that in 1973, the Central Bank of Nigeria introduced notes for 50 kobo, 1, 5, 10 and 20 naira. The 50 kobo notes were last issued in 1989. 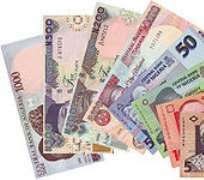 In 1991, 50 naira notes were issued, followed by 100 naira in 1999, 200 naira in 2000, 500 naira in 2001 and 1000 naira on October 12, 2005. In a similar vein, February 28, 2007 almost at the exit of Chief Olusegun Obasanjo administration, new versions of the 5 to 50 naira banknotes were introduced. Originally the 10, 20 and 50 naira were to be polymer banknotes, but only the 20 naira was made of polymer until the Federal Government resolution on Wednesday (Eve to Nigeria's 49th independent anniversary from the British colonialist). The notes are slightly smaller (130 x 23 mm) and redesigned from the preceding issues.